Penny for your thoughts: Severe Ice Impeding Shipping? Greenland's Ice Growing? Yes. Severe Ice Impeding Shipping? 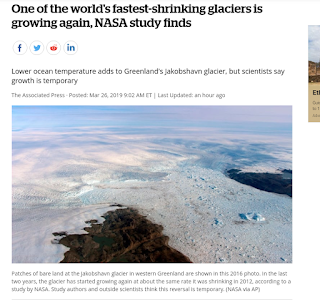 Greenland's Ice Growing? Yes. Severe ice conditions- Severe ice conditions- Saw them for myself this past week end. But let's pretend it's warm... Cause most people like pretend. They ignore nature's reality. Preferring their 'smart phone' delusions and the words of the agenda pushing soothsayers. As two Canadian Coast Guard icebreakers work to clear severe ice off of Port Colborne, at least a dozen vessels are being held up in the Welland Canal and just offshore. The delay is proving costly for ship owners, said Gregg Ruhl, president and chief executive officer of St. Catharines-based Algoma Central Corp. Severe ice. Ships waiting in the canal to get into Lake Erie. Recall my mentioning the wall of ice in Lake Erie? It's been cold. A couple of more spring like days, but, overall the trend is cool. Flurries are still in the forecast. Just like Arctic ice. That's an inconvenient truth! "Lower ocean temperature adds to Greenland's Jakobshavn glacier.....It started growing again at about the same rate in the past two years"
"That was kind of a surprise" Didn't fit the lie? "A natural cyclical cooling of North Atlantic waters likely caused the glacier to reverse course"
"The water in Disko Bay, where Jakobshavn hits the ocean, is about 2 C cooler than a few years ago, study authors said"
How is it that these 'scientists' didn't see this drop in ocean temperatures? No predictions? No computer models? No cooling? And yet, the real world does not comply with the agenda. I've seen them molt as early as January/ February and as late as the end of March- But it's got to warm up if they are molting. After all spring is here. The big birds are back- as in they've travelled back to the area- lots of vultures. Some will head further north still undoubtedly. What has not returned, as of yet. and I've been listening for them is the red wing black bird- They have a distinctive call.. and they are usually here around this time. Also saw the most bizarre thing last week! A squirrel who literally survived being eaten thanks to the skin and fur on his tail- It was surreal to see this bony structure/cartilage (don't know) devoid of fur/skin- but curled as squirrels always do while begging for food- I hope he/she does survive- the flesh around the base of the tail looked okay- Squirrels eyes were clear- did not appear sickly- but I tell you all- that was the only time in all my years of being outdoors I've ever seen such a sight! No one is stunned and amazed that the water temperature of the ocean surrounding greenland has dropped 2C or 5 F? That's big... think of the volume of water involved..
Wow, Penny, I thought I'd seen bad things happen to animals, but this tops all. If it's any consolation, it might be a balding disease that squirrels sometimes get, and apparently the hair can eventually grow back. Let's hope that's the case. One of the saddest things I've seen was last fall while waiting for a bus. The squirrels were very busy getting ready for winter and they were running from tree to tree, crossing the road frequently. I remember crying out "NO!" to a squirrel that I somehow knew was going to get hit by an oncoming car. And he did. And the driver kept right on going, though he had to have felt the bump. The squirrel's tail flipped straight up, then fell down, and that was it; I knew he was dead. I debated going to try to move him off the road, but then saw that all the cars after that were swerving around him. Then my bus came, and I felt rotten all afternoon. But that's life, I guess.We know that bad things happen to all living creatures, but when we see it, it never leaves our memory the way that so many other experiences and names and places do. "We know that bad things happen to all living creatures, but when we see it, it never leaves our memory ..."
and the bony structure is shrinking- I expect it's going to fall off and I'll have to call spiny squirrel- stubby squirrel. Seems healthy, definitely was hoping I'd brought peanuts or something? Hung around me for a while then gave up.